Sunday: Homemade turkey meatballs, penne pasta, jarred Sauce, roasted asparagus, carrot sticks, watermelon. These were possibly the best batch of meatballs I have made in a while. I should probably write down the recipe for you guys one of these days, but I think it comes out best when I wing it! I will try and give some basic instructions here and hope you can have great turkey meatballs too! I think it had a lot to do with the pile of fresh herbs I put in..I am growing fresh herbs in front of my house, and they are doing well. Maybe I do have a green thumb after all! So I served a lot of choices this meal, which isn’t always the case. I happened to have some carrot sticks left over from lunch, and watermelon that needed to be eaten up, so I put it out there, still in the containers from the fridge. We’re not fancy, and sometimes a few extra choices are good for a picky little one. Though this is one meal he’s pretty into. Ok meatballs–1 or a little more pounds of ground turkey thighs, a big squish of tomato paste, 1 egg, about 1/4 cup of breadcrumbs (I used Ians gluten free panko), about 1/4 cup of chopped fresh herbs (I used oregano, basil, parsley, and chives), some garlic powder, onion powder, salt, pepper, and a dash of cinnamon. Roll those puppies up and put them on a parchment lined baking sheet, bake for about 20 minutes on 375, turning occasionally. 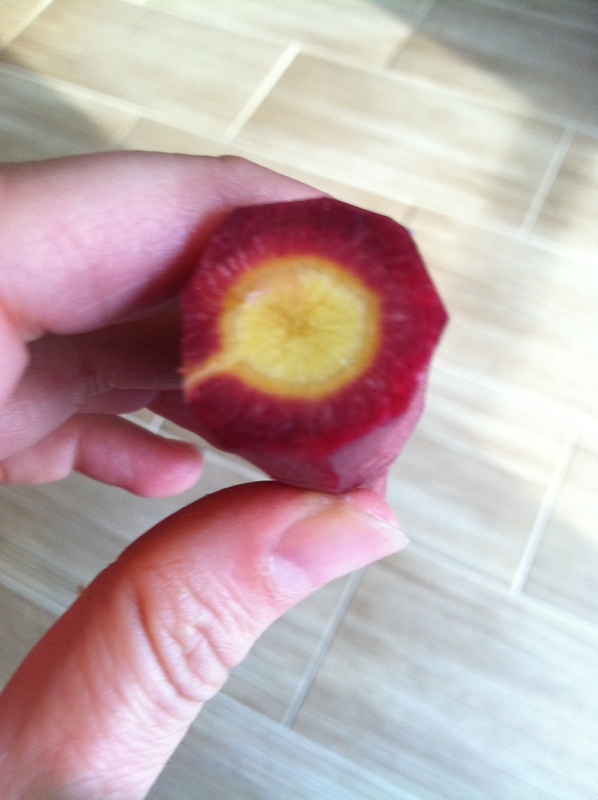 Look at this crazy purple carrot! Monday: Mexican sweet potato and black bean bake, salad bar (green leaf lettuce, cucumber, bell peppers, shredded cheddar cheese, cherry tomatoes), guacamole, salsa, sour cream, blue corn chips. This dinner did not work out so well. I planned this without realizing that it needed to bake for about 50 minutes total, and didn’t get home until 5:50, and for some crazy reason, I was still determined to make it. So we had some guac and chips and then had bath and hang out time. The sweet potatoes were STILL not cooked, and I ended up having to cook the dish for an extra 30-40 minutes. So we ate extra late and frankly I didn’t enjoy it that much, so I won’t share it with you here. Lesson learned; don’t try to bake sweet potatoes into a casserole, roast or steam them first. By the time they were finished the corn tortillas in the dish were dry in some spots and mushy in others, and the cheese in the dish was dried out. Blah. All that waiting for mediocre results. Oh well, you win some, you lose some. We still sat together and ate, so thats cool. Tuesday: Spicy Sesame Honey Chicken in a Crock Pot, Basmati rice, peas, strawberries. This was great because it was all done when we got home. However, I think it would have been better with the sesame and scallion garnish. No time for garnish tonight. Next time I would change the sauce up a bit I think; more honey, less tomato, add ginger, maybe a little mirin or sherry. And if you have the option I would stick with the recommendation to cook 5-7 hours, I cooked 8 and warmed for a bit, because thats how long I was gone. And it was a tiny bit overdone. Thursday: Homemade burgers from the freezer, whole wheat buns from TJs, frozen french fries, not sure if there was anything else, but like to think there was a fruit or vegetable served. I work Thursday nights so I’m not home for dinner! Friday: Scrambled eggs with fresh chives, bacon, toast, pepper jack cheese, salsa, avocado, sliced oranges, honeydew melon, cherry tomatoes, strawberries. The fruits and veggies were all things that were already cut up and needed to be end-of-the-week eaten.